The Aladdin project is a credible platform for Jewish-Muslim exchange and partnership on educational and cultural initiatives. With a network of supporters throughout the Arab world, Aladdin reaches thousands of people, sharing the knowledge and understanding of the holocaust. The funds were donated in order to produce an abridged version of the movie "Shoah", with Turkish, Arabic and Persian subtitles. Since its launch in March 2009 under the patronage of UNESCO, the Aladdin Project has become a credible platform for Jewish-Muslim exchange and partnership on educational and cultural initiatives. In 2012, Aladdin organized its first-ever public lectures on the Holocaust in several Muslim countries in the Middle East and North Africa, attended by more than two thousand intellectuals, academic scholars, civil society activists, journalists, students and youth in Cairo, Amman, Baghdad, Erbil, Rabat, Casablanca, Tunis and Istanbul. The success of those events led to plan another series of events in Muslim countries in early 2011, which included the screening of an abridged version of Claude Lanzmann’s film 'Shoah' with Turkish, Arabic and Persian subtitles. The abridged version was broadcast on one-hour weekly episodes in popular Arab television channels, including TRT (Turkey), France 24 in Arabic, Al-hurrah, Al Mehouar (Egypt) and the Persian satellite channel 1 (based in Los Angeles, with millions of viewers in Iran). 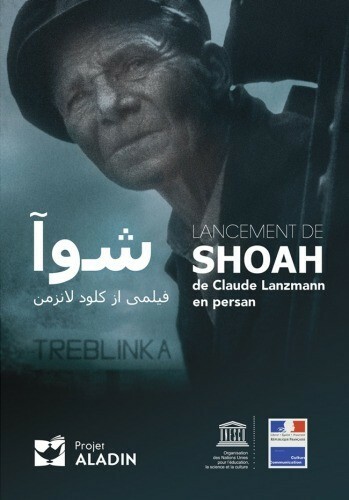 In addition, a full version of 'Shoah' with the subtitles was distributed in DVD, containing four discs and the book 'Shoah' in Turkish, Persian and Arabic. The project was implemented in close partnership with the French government and French embassies throughout the Arab world, who supported the project diplomatically and worked with local partners to organize the public premieres, distribute DVDs and secure the agreement with the various TV stations. Local partners include the National Library of Morocco in Rabat, Bahcesehir Istanbul University in Turkey, University of Tunis-Manouba in Tunisia, the Committee for interfaith Dialogue in Egypt, and the Universities of Baghdad and Erbil in Iraq. The events and the screening of the film were widely covered in over 500 newspapers, radio stations, television channels and information websites in the Muslim world. An analysis shows that the majority of the articles supported the basic premise of the events: rapprochement between Jews and Muslims and rejection of Holocaust denial.